Welcome to National Crane Inspection, LLC. Our primary function is to inspect and certify cranes, derricks, hoists, conveyor elevator spouts, and material handling devices. We survey towboats, barges and all marine going vessels. With over 15 years of experience inspecting mobile cranes, floating cranes, and other devices, strive to serve the heartland of America with our expertise. 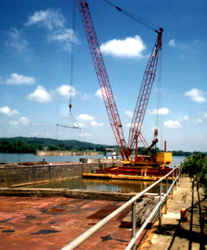 National Crane Inspection, LLC's management are leaders in development and presentation in crane and rigging programs since 1990. For more information, email Gary Lavender. "Dedicated to the Glory of God and the safety of workers"
Northern Central Office - National Crane Inspection, LLC.